The PURA UVBB-3 features three 20 Big Blue UV Chambers. 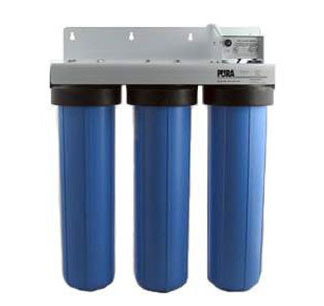 The first filter housing has a 5 micron sediment filter, which is the minimum recommended pre-filtration for effective UV disinfection. The second filter is a high capacity 10 micron carbon block to reduce chlorine, taste, odor, color and potentially harmful organics. The UV uses 22 watts of power and is rated for up to 15 gpm flow rates. The system features 1 1/2 inlet/outlet connections and can be easily reduced to 1 or 3/4 connections for homes with standard size plumbing. The system is 28 high, 23 wide and 9 deep. The UV Big Boy systems provide approximately 3 times the dirt holding and carbon loading capacity versus the UV-20 series systems.